Blackbird Presents Records announced today the release of Imagine: John Lennon 75th Birthday Concert, the concert film and album featuring the collection of legendary singers and superstars who came together for concert event in New York City at The Theater At Madison Square Garden to celebrate the songs of music icon John Lennon. Imagine: John Lennon 75th Birthday Concert features performances, interviews and compelling behind-the-scenes action with Aloe Blacc, Eric Church, Sheryl Crow, Brandon Flowers, John Fogerty, Peter Frampton, Juanes, Kris Kristofferson, Pat Monahan, Tom Morello, Willie Nelson, The Roots, Spoon, Chris Stapleton and Steven Tyler. Blackbird Presents CEO Keith Wortman is creator and executive producer of the show, Grammy and Emmy-winner Greg Phillinganes (Stevie Wonder: Songs in the Key of Life: An All-Star Grammy Salute) served as music director, and Gregg Gelfand (The Night That Changed America: A Grammy Salute to the Beatles) directed. 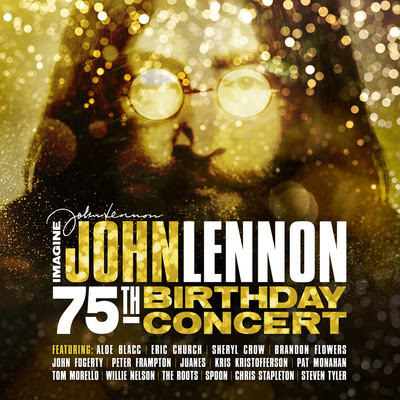 The full-length concert is available for purchase at: imaginejohnlennon75.com.